I saw the laser light show many years ago before I learned of the supposed connection to the movie. It still shows here locally. So I decided, in doing my blog research, to attend a showing of “Dark Side of the Moon,” one of “Rock’s” all-time best albums. I could have just played the CD while syncing up the movie, but decided that a much more fun trippy laser light show with some friends would let my imagination run wild! And this journey with friends was about the adventure to and from the venue and isn’t this what the blog is about? Adventures? The Laser Technician, whom I know, said they do sometimes have “synced up” music with parts of the movie. However, I noticed my hearing isn’t what it used to be and so the words were kind of garbled. I’ve since looked up the words. Some of the song titles do lend to the legend of an Oz connection. If there is any it is very loosely based interpretations, although I also hear lyrics of a great mind that takes you on a mind-filled journey. While I appreciate the below articles points of interest between the album and movie parts, I was more taken away with the light show and genius of Roger Waters. It didn’t disappoint! Plus I learned a few more “facts” about other rumored Roger Waters movie connections; “Blade Runner” for one. Roger, keep us guessing. Let the legend live! Allow me to clue you in on some of the highlights of what is supposed to synch up. Whenever the lyrics “the lunatic is on the grass” you’ll see the Scarecrow dancing a bit on a lawn. Right when the Scarecrow and Dorothy starting trotting down the yellow brick road the lyric “got to keep the loonies on the path” pops in. Whenever Dorothy leaves the fortune teller to go back to her farm the line “home, home again” will start. There’s the line “don’t give me that do goody goody bull—“ right when you see Glenda the Good Witch pop up in her little magical bubble ride. Speaking of witches, whenever The Good Witch and the Bad Witch are facing off, the lyric “…and who knows which is which” comes in. Get it? How about when the song “Brain Damage” starts? Well, that’s when the Scarecrow starts in with his “if I only had a brain” song. And, of course, right at the end of the album when you hear that faint heartbeat fading out what do you think is on screen. That’s right, Dorothy listening to the Tin Man’s chest for his heart. And that’s just a bit of how the lyrical content supposedly lines up. There are parts where a scene change happens and a song ends. The Munchkins dance seems to be perfectly choreographed to “Us and Them.” The dynamic singing in “The Great Gig in The Sky” seems to work perfectly with the tornado whisking around Dorothy. Whenever the movie transitions from black and white to color is when you hear those cash registers at the beginning of “Money.” Of course, we can’t forget the album cover and how that corresponds to the movie’s theme. So, is it coincidence or did members of Pink Floyd actually sit down and try to plan out an album that locks in to certain aspects of a classic film? Well, a lot of these examples point the finger at mere coincidence. Some people site how the first half of the album lines up with the black and white first segment of the film. But this only works if you start the movie and the album at precisely the right time. Why wouldn’t the album start right when the first frame of the film begins and not when the MGM Lion roars? Also, for that whole section there about how “Money” starts off the color portion of the film. Wouldn’t “Time” be a better fit for the movie’s theme? The long and short of it is that humans tend to see the hits more than the misses in cases like this. This is called apophenia, or confirmation bias. This means we tend to focus on and remember patterns within disorder (“hits”) and disregard any occurrence that does not fit (‘misses”). It’s like when people dream of a friend they haven’t seen in years and then the next day they run into them at a coffee shop. That may sound like a cosmic occurrence but people never consider all the other times they’ve dreamed of someone and didn’t meet them the next day. Why would “got to keep the loonies on the path” line be considered a “hit” when there’s a line that follows that states “the lunatic is in the hall” and it has nothing to do with what’s going on in the scene. It’s considered a “miss” but is disregarded because the “hit” of the previous line worked so well. And when does the “paper boy” pop in to the scene? It’s like a daily horoscope reading. You notice all the things that hit with the reading but you disregard all the things that miss it. It’s what happens to synching up Pink Floyd’s “Dark Side of the Moon” with “The Wizard of Oz.” There might be a couple of coincidences followed by hundreds of things that don’t work in the moment or the context. But what about the members of Pink Floyd? Have they been asked about it? 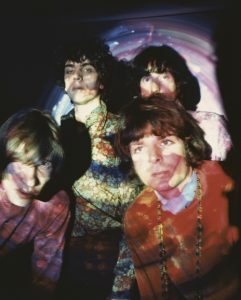 All members, past and present, of Pink Floyd have denied that there has been any purposeful linking of the album and movie. 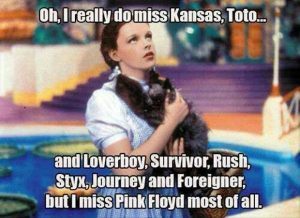 Everyone, that is, with the exception of Roger Waters. And that’s what keeps this going. Roger Waters can be hush-hush about it all but the other members have already weighed in. And the band members weren’t the only one to be present during the recording process. There’s also that thing they call a Producer in the way of Alan Parsons. Alan Parsons was instrumental in the timing and production of certain sound effects. All those heartbeats, footsteps, voice overs, clocks, and other sounds that are supposed to synch up so well came, in large part, to the credit of Parsons. 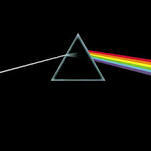 Basically, considering all the credible sources that have gone on record, there is no purposeful connection between Pink Floyd’s “Dark Side of the Moon” and “The Wizard of Oz.” This synchronicity element is due to the human need to find connections in things and retaining the “hits” and disregarding the “misses” of unconnected phenomena.